Toss the color-coded soft rope rings on the rack with 4 spikes and have active fun along or with the friends! 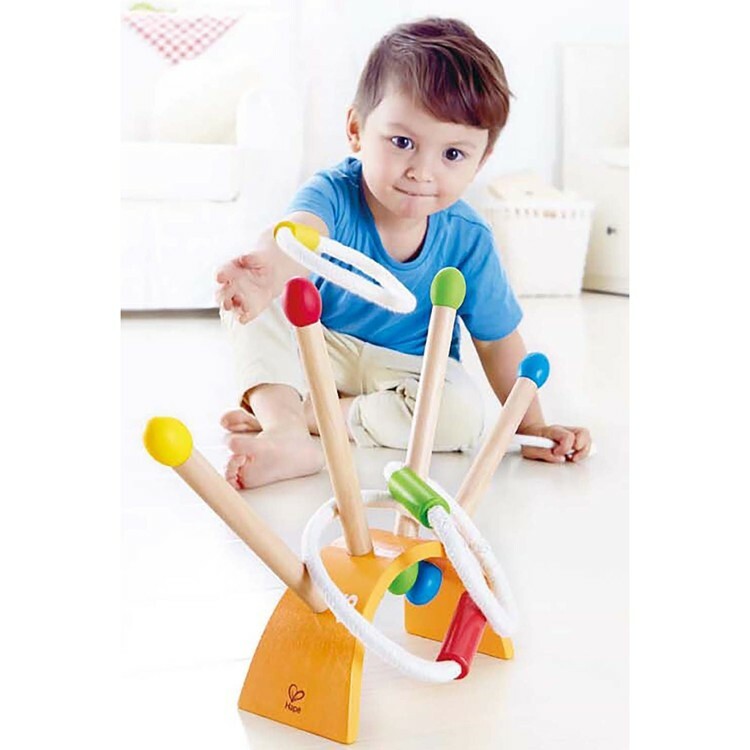 Generations of youngsters have been enjoying the popular fun activity of ring toss. 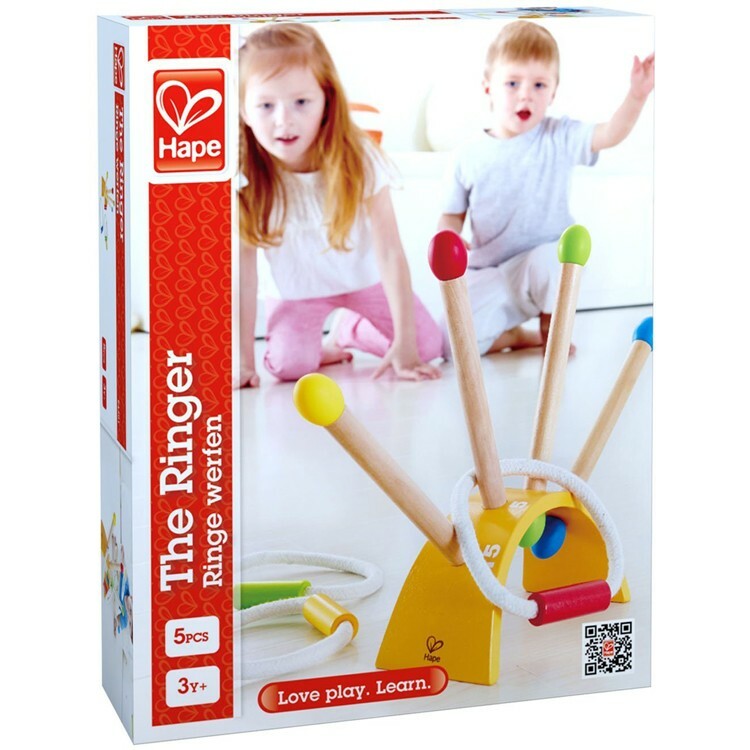 Hape now takes the fun of this sport game to a new level with The Ringer Ring Toss Play Set. 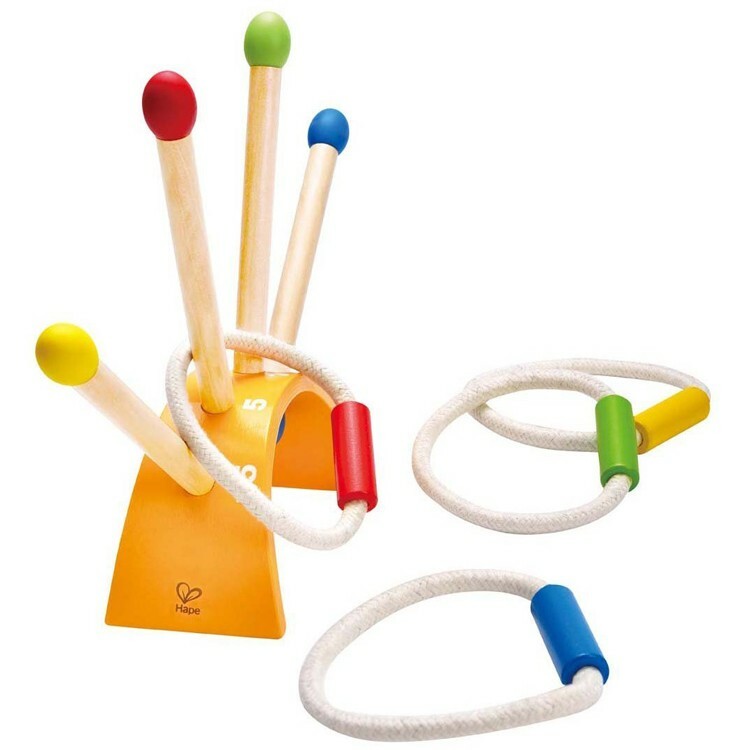 Get the soft rope rings and take turns tossing them on the 4 wooden color-coded stakes. Beginners try to toss the rings on any spike. More advanced players can try to reach the color matching one. Try to do your best and have lots of fun! 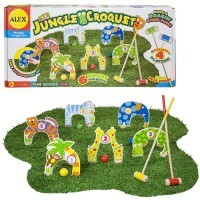 Kids can enjoy this sport toy indoors or outside in the backyard. 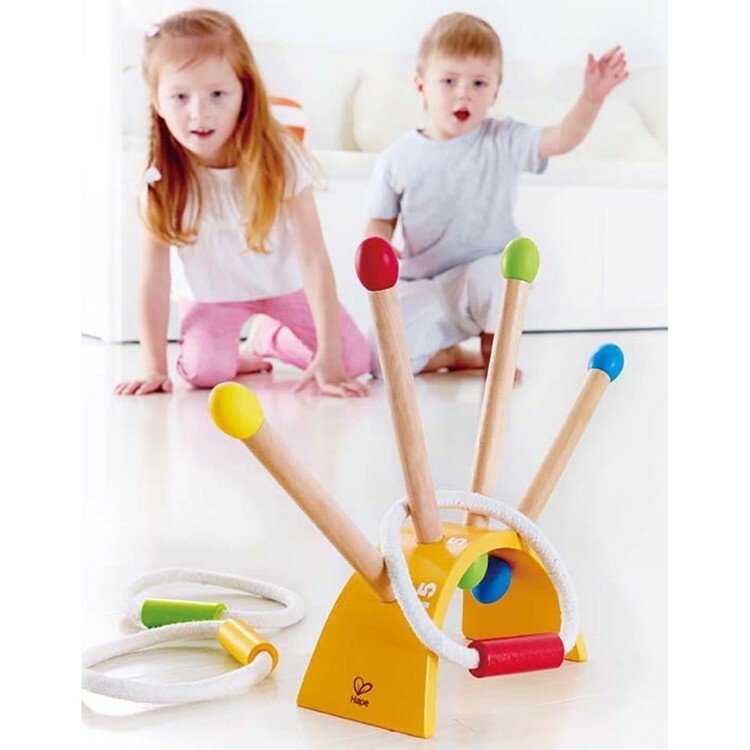 The Ringer Ring Toss Play Set from Educational Toys Planet includes a colorful wooden rack with 4 stakes and 4 tossing rings. The easy set up of this game allows you to play it right out of the box. 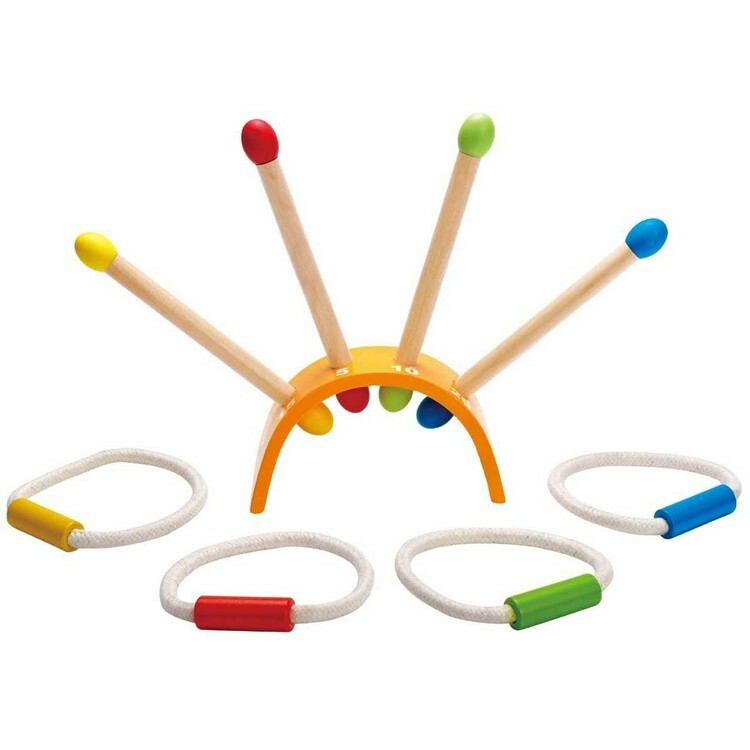 This kids version of classic ring toss is also a great addition for a school gym or backyard activity toys. 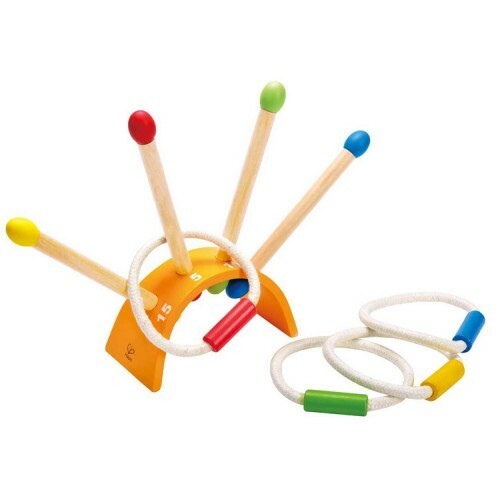 Dimensions of package 3.2" x 15.2" x 9.5"
Write your own review of The Ringer Ring Toss Play Set. Rating: 5 More durable than some reviews claim! A+++ by By A customer Fun! Great for our almost 4 year old. Wish I would have found this years ago. 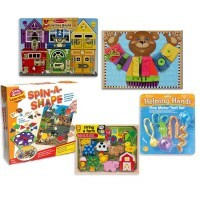 Rating: 5 Love Hape toys!!! by By A customer Love these toys! 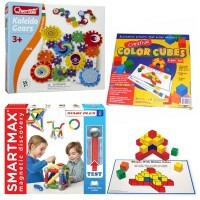 They are durable, colorful and fun. 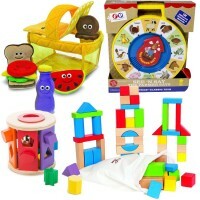 Hape products never fail to impress me and my kids. This game is played by my 8 year old, 3 year old and 1 year old sons. They all love it! 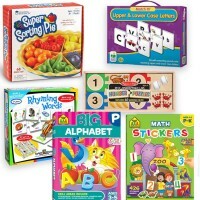 It can be placed closer or farther away depending on the age and skill of the child. 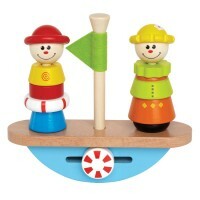 All of the Hape toys we own are durable and we'll used. Thanks for another great product! 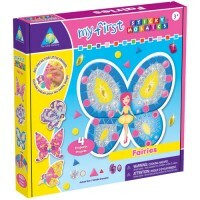 Rating: 5 Five Stars by By A customer Fun toy! Rating: 3 although I love hape usually by By A customer tips over when the rings are tossed to it. Kids are not into it. Wouldn't buy again, although I love hape usually. 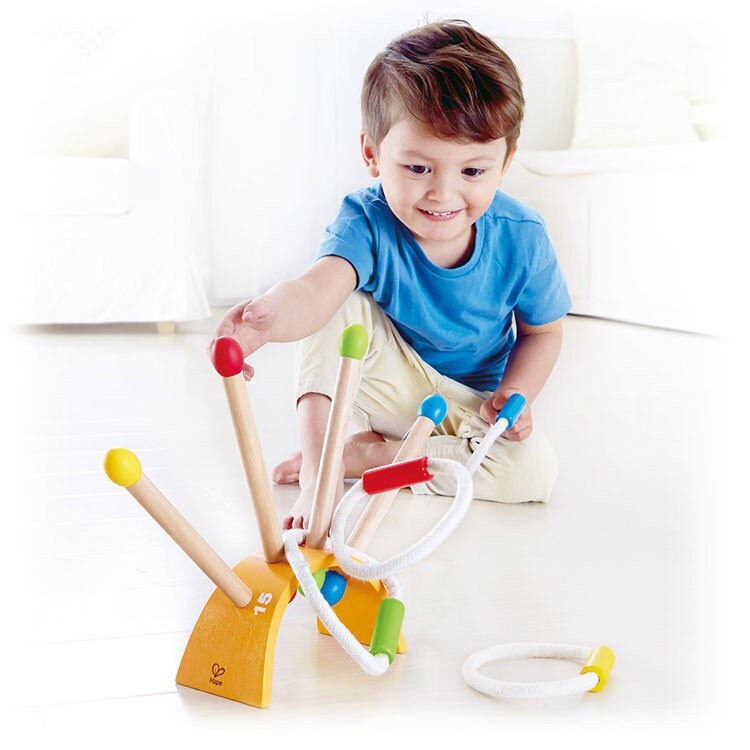 Rating: 5 Fun, indoor game by By A customer These are fun, my 2 year old got them for christmas and they are a nice indoor, winter game. It doesn't not tip over easily. Rating: 3 Not impressed by By A customer I wasn't impressed with this toy. 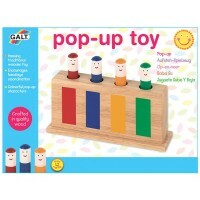 I bought it for my grandson however it easily tips over when he tosses the rings. 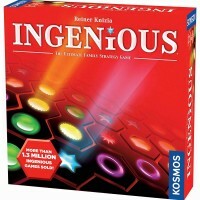 Rating: 4 Four Stars by By A customer lots of fun and nice looking in any room. 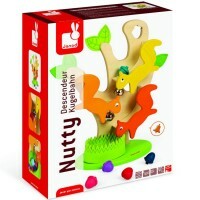 Rating: 5 fun and good quality by By A customer Fun active game to play in the house.